After World War II, President Harry Truman was being approached on all sides about building a Jewish state in Palestine. The pro-Israel lobby was pushing for its own sovereign nation, but Truman was leaning toward a two-state solution while his State Department said the British should keep control of Palestine. 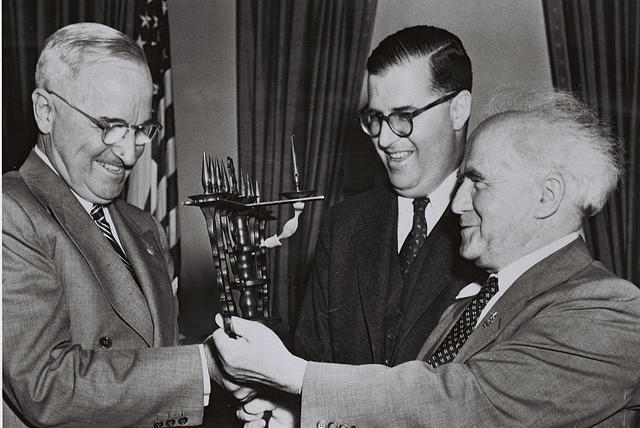 Facing political pressure, Truman eventually called for the U.S. to recognize Israel, but his correspondence shows that he knew it would not be a peaceful solution. In his latest book, Genesis: Truman, American Jews, and the Origins of the Arab-Israeli Conflict (Farrar, Straus & Giroux/2014), John Judis traces the conflict back to Zionist movement in the 1880s, and Truman’s dilemma in the years leading up to the birth of Israel. Judis will be speaking at the Kehillah Synagogue in Chapel Hill tonight at 7:30 p.m. Host Frank Stasio talks with John Judis about Genesis. Israel is often seen through the lens of the Israeli-Palestinean conflict, or through the stories of the Holocaust. Shai Ginsburg wants to change that, to show what life is really like for people in Israel. So he created a film series to showcase true stories from the region.